The Christmas Season is upon us once again, which means it’s time to put up those decorations! 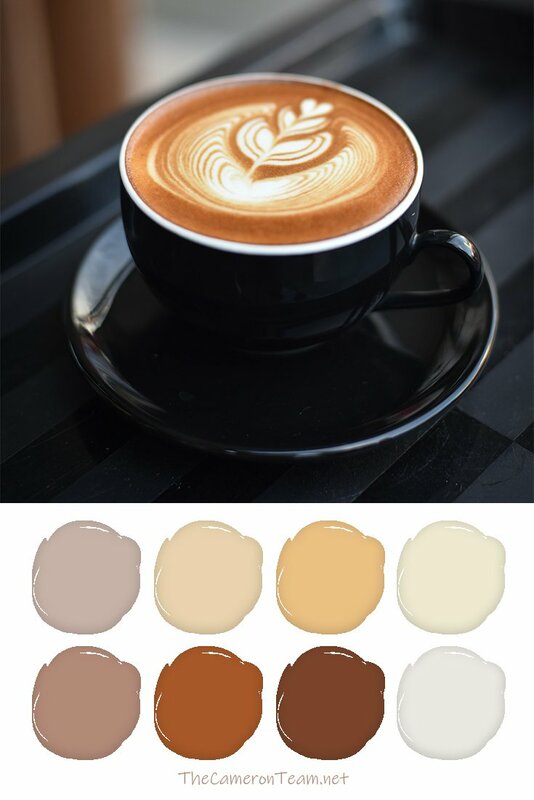 Are you looking for a way to freshen up your exterior decor? 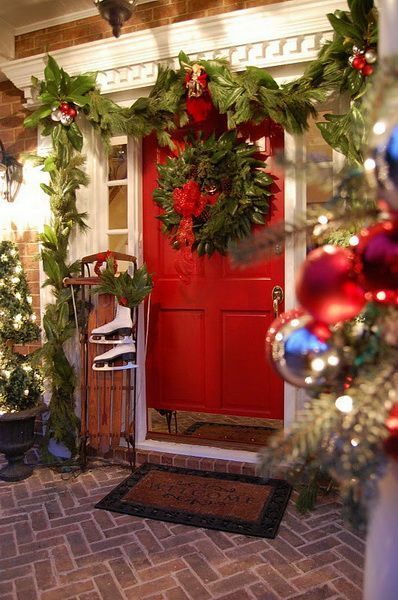 Here are some stunning front porches decorated for Christmas that are sure to have you humming your favorite carols. 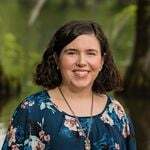 Make sure you click through the sources, because many of them have additional pictures to oogle at. 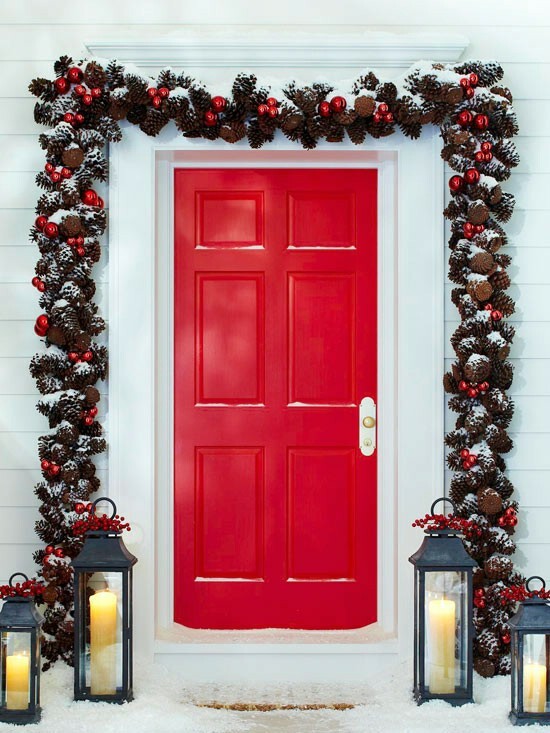 Who else other than Pottery Barn would be able to replicate the iconic Christmas front porch? Their staff does such a great job staging their products. I love how they even have packages on the front steps, like presents were just delivered. If you are a fan of “Babes in Toyland”, chances are you’ll like this front porch featuring a giant toy soldier and classic glass ornaments. 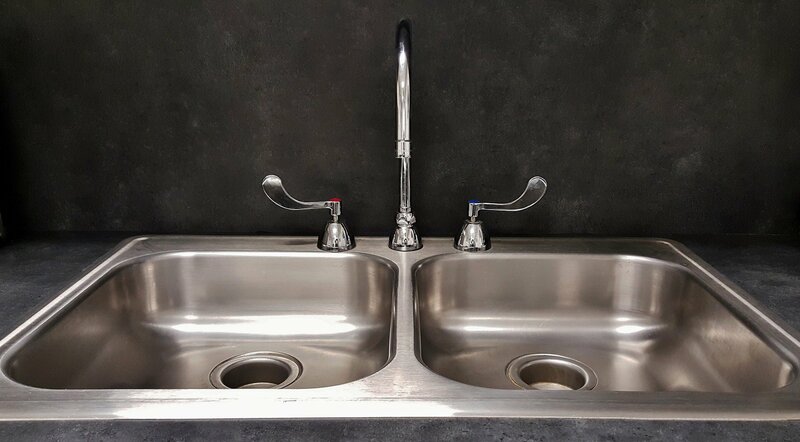 Okay, they may not be glass, but sure look like it. There are also some candy designs woven in and the red/light green color scheme makes it look even more vintage. 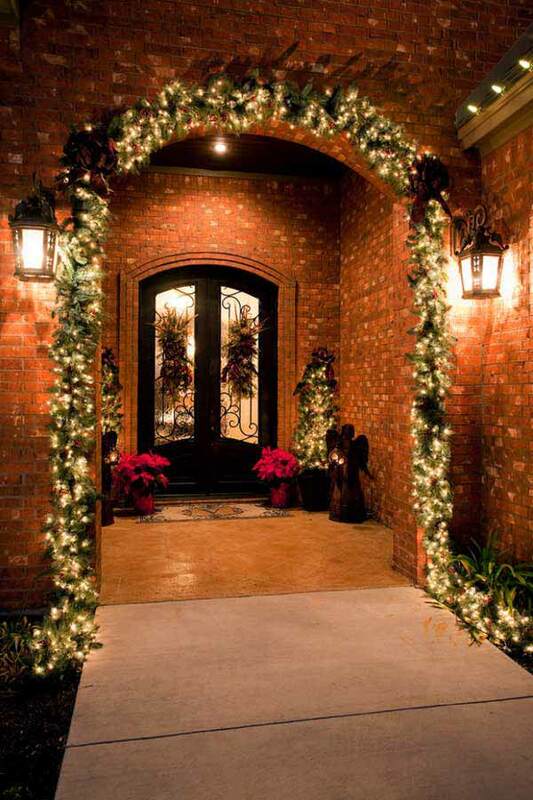 Better Homes and Gardens is another good source for Christmas inspiration. 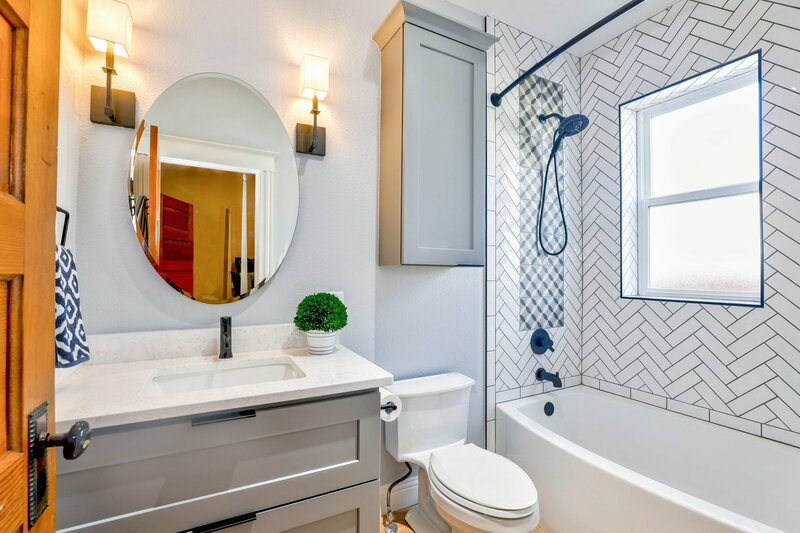 Here, the designer utilized the door’s tall, long lines and incorporated candle lanterns that mimic them. Pine cones and berries provide a nice rustic, earthy look that harken back to an older style of decorating. Source: Better Homes & Gardens. I’m really loving the white lights with the greenery for the holidays. The earth naturally provides us some beautiful decorations. This is a chance to showcase them while still maintaining that Christmas sparkle. The designer of this front porch really utilized its depth and varying architectural elements to create an eye-catching display. First, there’s the giant green garland with bows. Next, you’re drawn in to the arch of flowers and ribbons. Then, the light fixtures. 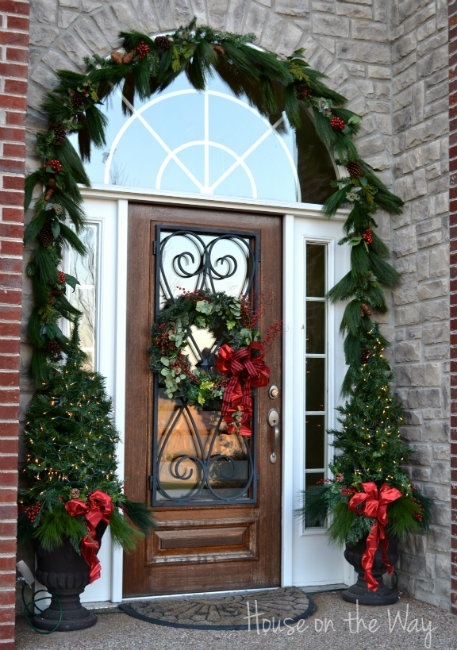 Finally, your eyes rest on the poinsettias on the doors. Multidimenional and charming. Chalkboards are all the craze right now. DIYers are using chalkboard paint on everything from walls to furniture. It’s even making its way onto front porches for Christmas. 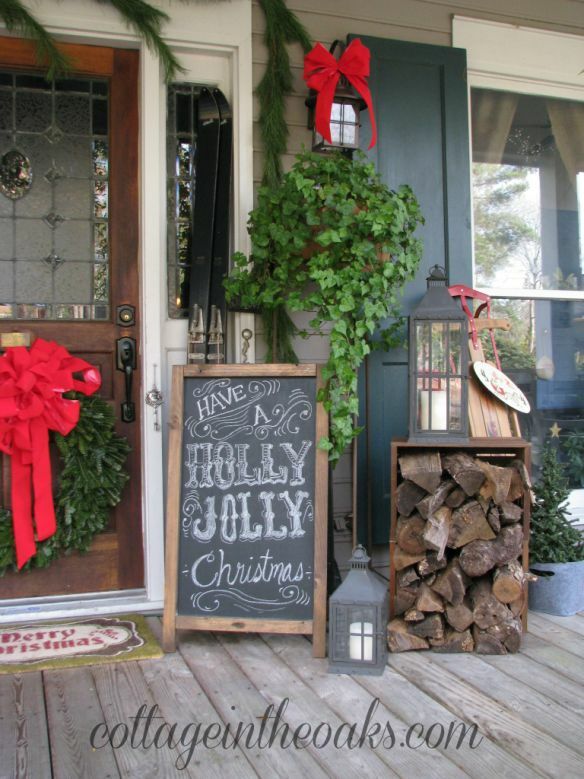 Here, the chalkboard is decorated with a Christmas phrase and paired with some rustic touches – firewood, a vintage sled, and lantern – to create a country feel. 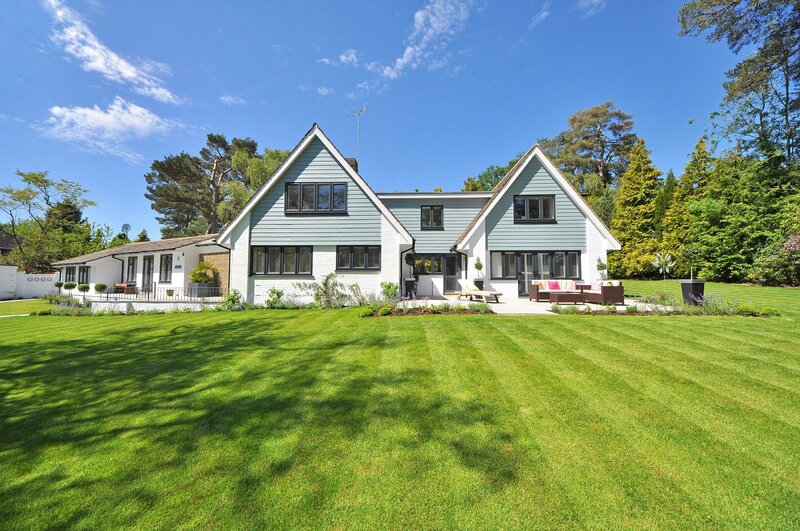 Source: Cottage in the Oaks. Heres’s a front porch with a Southern touch. Incorporated into the traditional pine garland are Magnolia leaves. 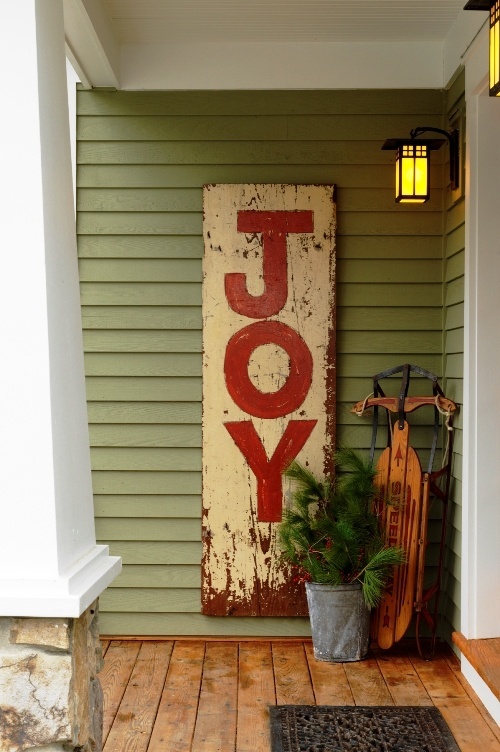 Add to that some ball ornaments, ice skates, and a vintage sled, and the look is complete! Source: Between Naps on the Porch. 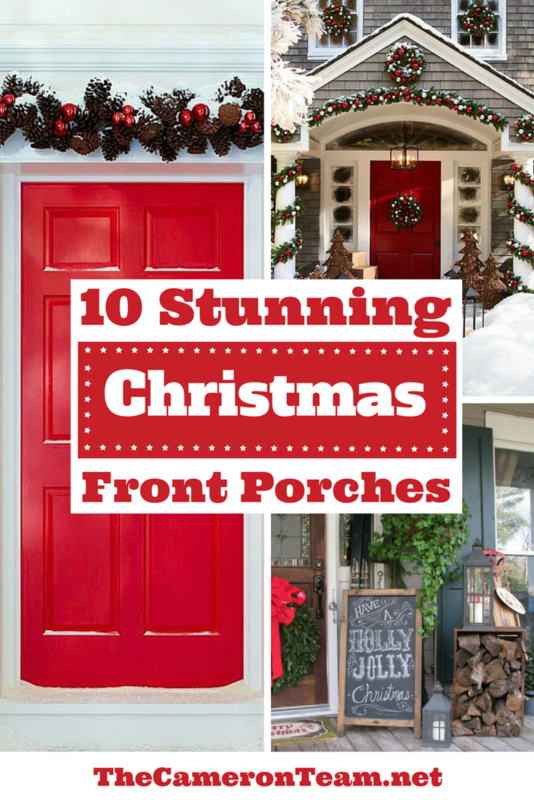 This front porch is perfect for homeowners who don’t like to overembelish for the holidays. It’s simple with a touch of vintage, but still really makes a statement. 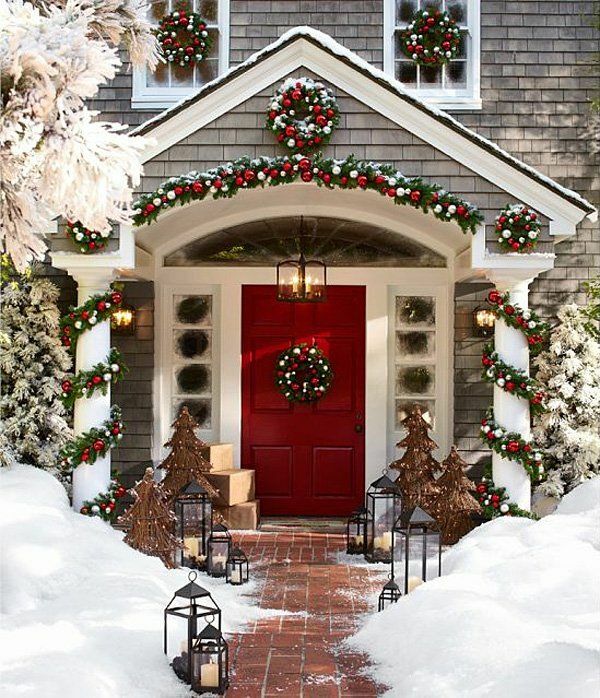 These homeowners already had a frontdoor with beautiful lines, which they accented with gorgeous garland, a wreath, and Christmas Trees. Source: At the Picket Fence/Home Talk. 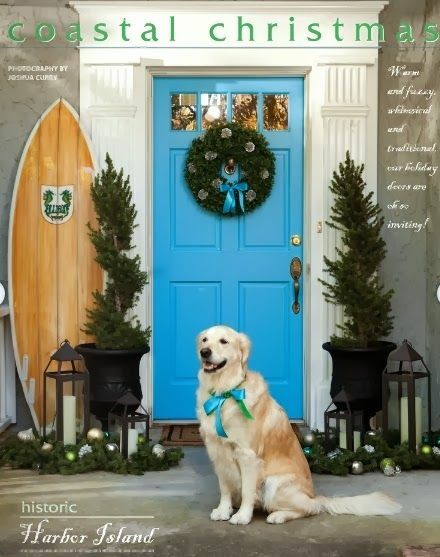 Finally, who better to demonstrate coastal Christmas decor for your front porch than our local Wrightsville Beach Magazine? 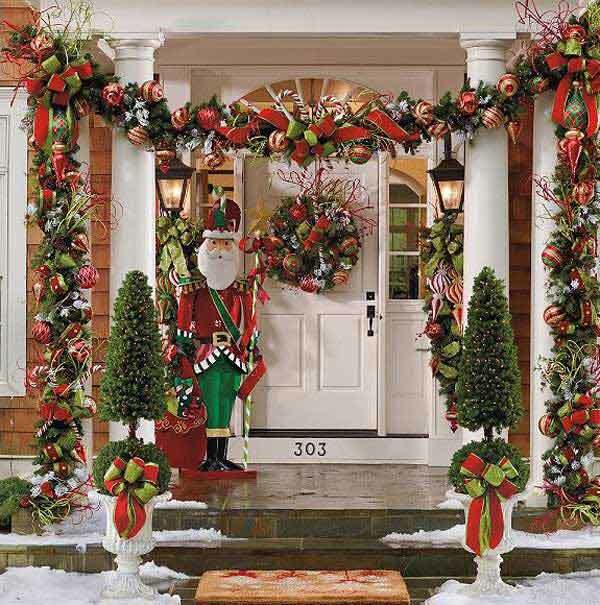 Again, if you want more Christmas decorating inspiration for your front porch, click through to the source sites. They have a lot to share! Once you have created your holiday display, please come back and share in the comments. We’d love to see!